Architecture has been in my life as long as art has. I’m experienced working in the architectural industry, however the work I’ve created professionally has been designed and built in collaboration with many other people and the design work is the intellectual property of the firms that were hired for the project. For the following projects on this website are projects where I worked independently. 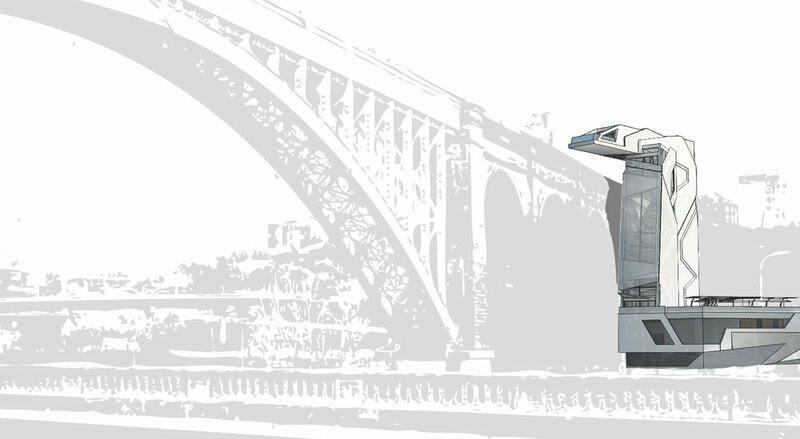 This design competition let the entrants create the program for the building, but required the design to be built near or respond to the High Bridge in some manner. The High Bridge connects uptown Manhattan (Harlem) to the Bronx. The area is heavy with the industrial feel of the railways and an interstate on the lowest level and a pedestrian bridge above that connects to the heart of neighborhoods on either side. My design creates a cultural center offering artists studios, a performance space, an outdoor gathering space and a sky gallery cantilevered over bridge. This architectural competition offered the opportunity to design a large house directly on the beach in the Bahamas. I designed all of the architecture and a coworker did the interior design. This open program competition simply asked the entrants to focus in a certain area of the South Street Sea Port. My proposed design focused on infill empty lots and to build a new pier visitor center extending out into the East River. This design proposal also created an outdoor park underneath the FDR overpass.